The optic chiasm or optic chiasma ( /ɒptɪk kaɪæzəm/; Greek χίασμα, "crossing", from the Greek χιάζω 'to mark with an X', after the Greek letter 'Χ', chi) is the part of the brain where the optic nerves partially cross. The optic chiasm is located at the bottom of the brain immediately inferior to the hypothalamus. The optic chiasm is found in all vertebrates, although in cyclostomes (lampreys and hagfishes) it is located within the brain. Brain viewed from below; the front of the brain is above. Visual pathway with optic chiasm (X shape) is shown in red (image from Andreas Vesalius' Fabrica, 1543). The optic nerve fibres on the nasal sides of each retina (which correspond to the temporal side of each visual field, because the image is inverted) cross over (decussate) to the opposite side of the brain via the optic nerve at the optic chiasm (decussation of medial fibers). The temporal hemiretina (corresponding to the nasal visual field), on the other hand, stays on the same side. The inferonasal retina are related to anterior portion of the optic chiasm whereas superonasal retinal fibers are related to the posterior portion of the optic chiasm. The crossing over of optic nerve fibres at the optic chiasm allows the visual cortex to receive the same hemispheric visual field from both eyes. Superimposing and processing these monocular visual signals allow the visual cortex to generate binocular and stereoscopic vision. For example, the right visual cortex receives the temporal visual field from the left eye, and the nasal visual field from the right eye, which results in the right visual cortex producing a binocular image of the left hemispheric visual field. The net result of optic nerve crossing over at the optic chiasm is for the right cerebral hemisphere to sense and process left hemispheric vision, and for the left cerebral hemisphere to sense and process right hemispheric vision. This crossing is an adaptive feature of frontally oriented eyes, found mostly in predatory animals requiring precise visual depth perception. (Prey animals, with laterally positioned eyes, have little binocular vision, so there is a more complete crossover of visual signals.) Beyond the optic chiasm, with crossed and uncrossed fibers, the optic nerves become optic tracts. The signals are passed on to the lateral geniculate body, in turn giving them to the occipital cortex (the outer matter of the rear brain). During development, the crossing of the optic nerves is guided primarily by cues such as netrin, slit, semaphorin and ephrin; and by morphogens such as sonic hedgehog (Shh) and Wnt. This navigation is mediated by the neuronal growth cone, a structure that responds to the cues by ligand-receptor signalling systems that activate downstream pathways inducing changes in the cytoskeleton. Retinal ganglion cell (RGC) axons leaving the eye through the optic nerve are blocked from exiting the developing pathway by Slit2 and Sema5A inhibition, expressed bordering the optic nerve pathway. Ssh expressed at the central nervous system midline inhibits crossing prior to the chiasm, where it is downregulated. The organization of RGC axons changes from retinotopic to a flat sheet-like orientation as they approach the chiasm site. In Siamese cats with certain genotypes of the albino gene, this wiring is disrupted, with more of the nerve-crossing than is normal, as a number of scholars have reported. To compensate for lack of crossing in their brains, they cross their eyes (strabismus). This is also seen in albino tigers, as Guillery & Kaas report. Scheme showing central connections of the optic nerves and optic tracts. 3D schematic representation of optic tracts. Transformations of the visual field toward the visual map on the primary visual cortex. Cerebrum, inferior view, deep dissection. Guidance of axon crossing and non-crossing during development. The crossing of nerve fibres, and the impact on vision that this had, was probably first identified by Persian physician "Esmail Jorjani", who appears to be Zayn al-Din Gorgani (1042–1137). 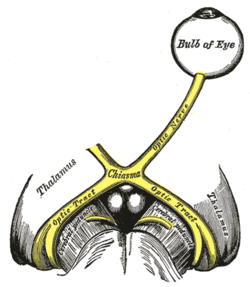 Wikimedia Commons has media related to Optic chiasm. ^ Colman, Andrew M. (2006). Oxford Dictionary of Psychology (2nd ed.). Oxford University Press. p. 530. ISBN 978-0-19-861035-9. ^ Bainbridge, David (30 June 2009). Beyond the Zonules of Zinn: A Fantastic Journey Through Your Brain. Harvard University Press. p. 162. ISBN 978-0-674-02042-9. Retrieved 22 November 2015. ^ de Lussanet, Marc H.E. ; Osse, Jan W.M. (2012). "An ancestral axial twist explains the contralateral forebrain and the optic chiasm in vertebrates". Animal Biology. 62 (2): 193–216. arXiv:1003.1872. doi:10.1163/157075611X617102. ISSN 1570-7555. ^ Purves, Dale; Augustine, George; Fitzpatrick, David; Hall, William; LaMantia, Anthony-Samuel; White, Leonard (2012). Neuroscience. Sinauer Associates. p. 261. ISBN 978-0-87893-695-3. ^ Erskine, L.; Herrera, E. (2007). "The retinal ganglion cell axon's journey: Insights into molecular mechanisms of axon guidance". Developmental Biology. 308 (1): 1–14. doi:10.1016/j.ydbio.2007.05.013. PMID 17560562. ^ Gordon-Weeks, PR (2005). Neuronal Growth Cones. Cambridge University Press. ISBN 9780511529719. ^ a b c Herrera, E; Erskine, L; Morenilla-Palao, C (2019). "Guidance of retinal axons in mammals". Seminars in Cell & Developmental Biology. 85: 48–59. doi:10.1016/j.semcdb.2017.11.027. PMID 29174916. ^ Rasband, Kendall; Hardy, Melissa; Chien, Chi-Bin (2003). "Generating X, Formation of the Optic Chiasm". Neuron. 39 (6): 885–888. doi:10.1016/S0896-6273(03)00563-4. ^ Guillery, RW; Mason, CA; Taylor, JS (1995). "Developmental determinants at the mammalian optic chiasm". The Journal of Neuroscience. 15 (7): 4727–4737. doi:10.1523/JNEUROSCI.15-07-04727.1995. ^ Erskine, L; Reijntjes, S; Pratt, T (2011). "VEGF signaling through neuropilin 1 guides commissural axon crossing at the optic chiasm". Neuron. 70 (5): 951–965. doi:10.1016/j.neuron.2011.02.052. PMC 3114076. PMID 21658587. ^ Kuwajima, T; Yoshida, Y; Pratt, T (2012). "Optic chiasm presentation of Semaphorin6D in the context of Plexin-A1 and Nr-CAM promotes retinal axon midline crossing". Neuron. 74 (4): 676–690. doi:10.1016/j.neuron.2012.03.025. PMC 3361695. PMID 22632726. ^ Schmolesky MT, Wang Y, Creel DJ, Leventhal AG (2000). "Abnormal retinotopic organization of the dorsal lateral geniculate nucleus of the tyrosinase-negative albino cat". J Comp Neurol. 427 (2): 209–19. doi:10.1002/1096-9861(20001113)427:2<209::aid-cne4>3.0.co;2-3. PMID 11054689. ^ Guillery, RW; Kaas, JH (June 1973). "Genetic abnormality of the visual pathways in a "white" tiger". Science. 180 (4092): 1287–9. Bibcode:1973Sci...180.1287G. doi:10.1126/science.180.4092.1287. PMID 4707916. ^ Guillery RW (May 1974). "Visual pathways in albinos". Sci. Am. 230 (5): 44–54. Bibcode:1974SciAm.230e..44G. doi:10.1038/scientificamerican0574-44. PMID 4822986. ^ Davis, Matthew C.; Griessenauer, Christoph J.; Bosmia, Anand N.; Tubbs, R. Shane; Shoja, Mohammadali M. (2014-01-01). "The naming of the cranial nerves: A historical review". Clinical Anatomy. 27 (1): 14–19. doi:10.1002/ca.22345. ISSN 1098-2353. PMID 24323823. Jeffery G (October 2001). "Architecture of the optic chiasm and the mechanisms that sculpt its development". Physiol. Rev. 81 (4): 1393–414. doi:10.1152/physrev.2001.81.4.1393. PMID 11581492.